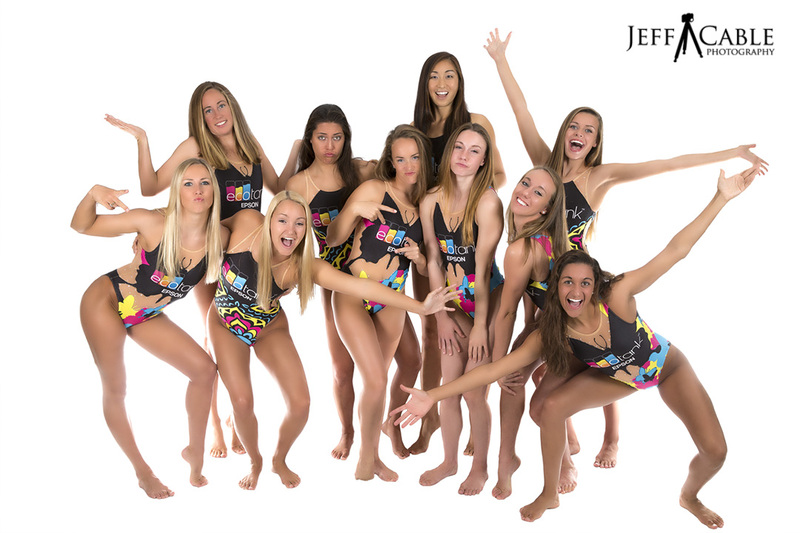 Last month I was contacted by Epson and their PR agency and asked to photograph the US Synchronized Swimming Team for an upcoming event. At the time, I had no idea just how big this campaign would be, but I readily agreed to do the job. I mean, how perfect was this? Shooting another Olympic team and for a great company like Epson. Early on a Tuesday morning, I met up with the team where they are training, and we set up for the photo shoot. (I have included photos of the setup later in this blog post.) The plan was for me to shoot portraits of all the girls, including individual shots and group photos. But you know that I had to do more than they expected. See those pretty bathing suits? Those were all printed on Epson printers - seriously! This was the second of the 4 groups, each wearing different bathing suits. Then we did a group shot with all the girls. And the same girls wearing their Epson printed cover-ups. I suggested that they bring some of the printers along so that we could have the girls hold one of the cool new Ecotank printers in the shot. After we shot the other group shots, we had some of the girls change into a different suit. Here is a "behind the scenes" shot of me photographing the girls. I was changing some of the lights around, since we switched from group shots to individuals photos. As part of this process, I told this young lady to relax for a little bit. She turned and looked down at the ground and I shot this test shot. We all liked it. Sometimes it is the unplanned shots that just work. As you might be able to see here, I was using four light sources for the shots. Two of the Canon 600EX-RT flashes were on the floor pointing at the white backdrop, one 600EX-RT in a RapidBox diffuser to my left and two more 600EX-RT flashes were pointing into the umbrella to my right (photo below). As we were finishing up the photo shoot, I suggested that we get four of the ladies, in all four suits in one shot. And then, just for the fun of it, I told all the girls to be crazy and have fun. I got this shot. It was not used for the campaign, but I love it. The challenge of this shot was in the retouching. As you can see in the original photo (straight out of the Canon 5D Mark III), I had a lot of work to do to knock out the background. Not only did the girls spill out past the backdrop, but, since the room was small and I could not get the girls further from the backdrop, there were also a ton of shadows on the backdrop which I had to knock out. This one photo took me more than an hour to retouch. Someone used my iPhone to grab this shot of me and the girls previewing some of the images. Fun stuff. Once we were done with all the portraits, I suggested that I use the Phantom 3 drone to get some aerial shots of the girls in the pool, and they loved that idea. This was so much fun to capture and the results were just too cool. This is why I love the DJI aerial cameras. If it were not for these devices, I could never have gotten a shot like this! Then I switched back to the Canon 5D Mark III to get a couple of shots of the US Synchro Team in the pool. And set up this shot of all of us to mark the occasion. Here are a couple photos which they created for the #swimminginink campaign in New York yesterday. If you missed this in person or streamed online yesterday, it was awesome. 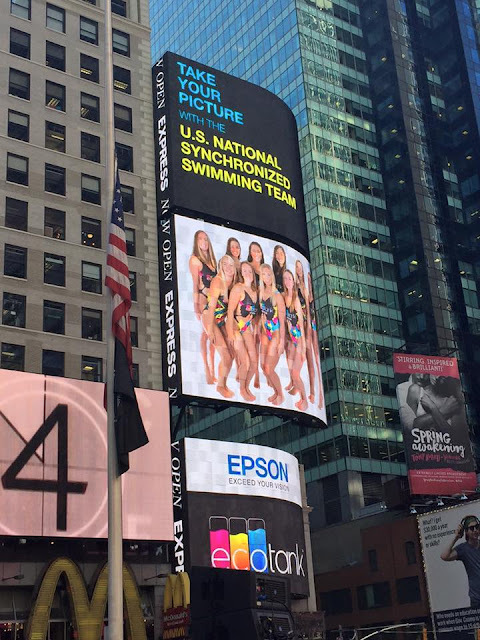 They built a see-through swimming pool in Times Square and had the US Synchro team performing in the heart of New York all day. And it was so cool to see my photos so large on a billboard in Times Square! Thank you so much for sharing this entire experience! If it is possible for you to have too much fun, I think you are doing it really well. Having your photo up in giant size in Times Square is the icing on the cake. 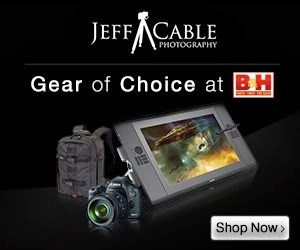 Way to go, Jeff!! Those suits are very cool. I'm impressed they didn't get affected by the water or chemicals in the pool. And of course your shots are amazing as usual. Thanks for sharing the behind the scenes material. That is what makes your blogs very interesting to read.